Google has been making quite a few tectonic changes to its plethora of services ever since the company was officially rechristened as Alphabet. Making steadfast gains in the mobile or cell phone segment with a myriad of apps clearly targeted at smartphone users, Google has rolled out several light versions of its existing applications. These developments have been timed with the rollout of Android Go, a much lighter operating system for smartphones than the more resourceful Android. Google has already launched Google Go, YouTube Go, Google Maps Go, Assistant Go and Files Go. Now, it has Gmail Go as an alternative to the Gmail app. Gmail Go is basically a lighter version of the Gmail app. It is designed for lower end smart phones and for users in emerging markets who may not have as much bandwidth or as much data available as the developed markets. The growth of mobile phones or smartphones and by extension of services such as Google, including Maps, YouTube and Gmail, is remarkable in emerging markets and hence the company has worked on a whole lineup of apps that are almost the same as their traditional versions but lighter and hence more appropriate for cheaper phones with fewer high end specs, most notably storage. Gmail Go has been tested and it does indeed take up much less space. Naturally, it also consumes less data. The regular version of Gmail takes up just short of 21MB of data to be downloaded and after installation it takes up around 47MB space in a smartphone. Gmail Go will consume less than 10MB of data to be downloaded and post installation it takes up around 25MB of space. Both are impressive given the fact that the lighter version will have most of the useful features of the regular version. Gmail Go will still have support for multiple accounts, there will be the now standardized conversation view, users will be able to access attachments, there are push notifications for new emails, the app will prioritize emails from family, friends and users with whom one corresponds frequently and there would be segregation of social and promotional emails. In other words, Gmail Go will look and feel, work and be as useful as Gmail. However, there may be some issues owing to the less storage space and also the fact that the full version is not being downloaded onto the device. Some users who have been able to test the Gmail Go app have reported that scrolling is not ideal. Some people have experienced syncing of emails to be capped to fewer days than what the regular app does. These may be temporary issues. Like all other apps in the kitty of Google Go and available on Android Go, having a lighter version would save data and storage space. This is particularly helpful for users of smartphones that have limited features and when one is in areas where data availability may be a concern. It is not just bandwidth but also the speed of mobile data or wireless internet that needs to be factored in. The lighter version will still function at slow speeds. 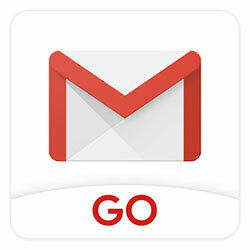 › Link to download the official Gmail GO for Android devices -> click here. There is a bit of uncertainty if everyone will have access to Gmail Go. It is being reported that Gmail Go will be available through Play Store but only on devices that are running the Android Go operating system. In effect, anyone who is running an Android version other than Android O Go will not have Gmail Go available on their Play Store. The way Google would be enforcing this is by having Gmail Go preinstalled in Android O Go powered phones and the app can only be updated or upgraded based on what is available through the Play Store. This perhaps indicates that Google is not intending to change Gmail or the conventional apps. It is simply offering an alternative. If anyone had thought that the Go versions are going to be substitutes of the regular apps, then that is not happening, at least for now. The launch and subsequent availability of Gmail Go will be helpful for anyone in emerging markets switching from feature phones to smartphones.